Specialist Auctions Vintage section opened in June of 2006 but the site itself opened late in 2005. What motivated you to go into the vintage and pattern auction business? We had a request from Margaret Bolger of Artizania to open a vintage and antique clothing section. In December of 2006 our current moderator, Margaret Leyden, joined us as a seller and co-moderator of the Vintage and Antique Clothing Section and is the moderator at this time and a member of the Vintage Fashion Guild. Where are you based? Specialist Auctions is based in the UK but we are truly an international site with more than 50% of our sellers based in the U.S. We have vintage clothing, vintage textiles and vintage pattern sellers from Lapland, the UK, Peru and the US. what's the weirdest/best/craziest/most beautiful thing you've ever found? What do you wish someone would ask you about your site? How did we have the nerve to set the site up in the first place ? We have new sellers come on board and watch them have success with selling their items. It's also great to see buyers come on board and be pleased with their purchases and the service they receive. If this wasn't enough Specialist Auction Action for you, check out Marge's blog, where she's been profiling SA sellers all week, in slideshows. Marge’s blog is nice…I especially like that hibiscus maxi dress….so anti-autumn! 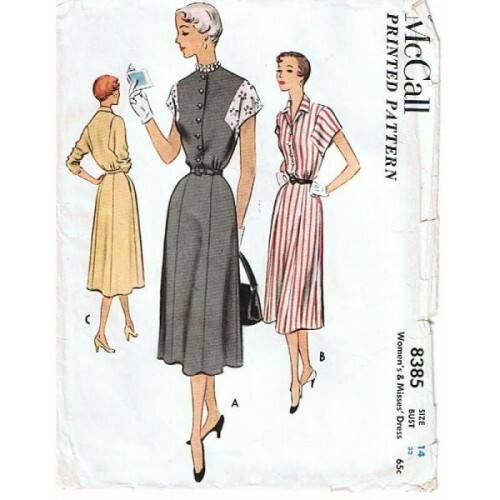 The way the sleeves are done in that McCall’s pattern is really interesting. Wish it were my size. Thank you so much for the interview, Erin dahling! Specialist Auctions is truly THE site to buy vintage nowadays, and Marge does a truly fantastic job as moderator. What other site has live moderators to make sure no fakes or reproductions sneak into their various categories?